I love Shulie's blog and enjoy discovering many new things to try from her Jewish heritage. Several times I have been happily surprised to learn about Jewish dishes that may have been influenced those that I grew up eating all the way in Kerala in the south of India, among my Syrian Christian community there. I am very excited that I am getting to do a guest post for her inspirational blog as part of her Indian Food Series, which has featured some of my most favorite Indian food bloggers. Since I had just baked a batch of these Nankhatais for a cookie swap I asked her if she would like a post on these and I was happy when she said she loved them and that her mom used to make them for her. Nankhatais (Nan-kaa-taai), are buttery, fragrant Indian shortbread cookies, which I think make great edible gifts this holiday season for the people you love. 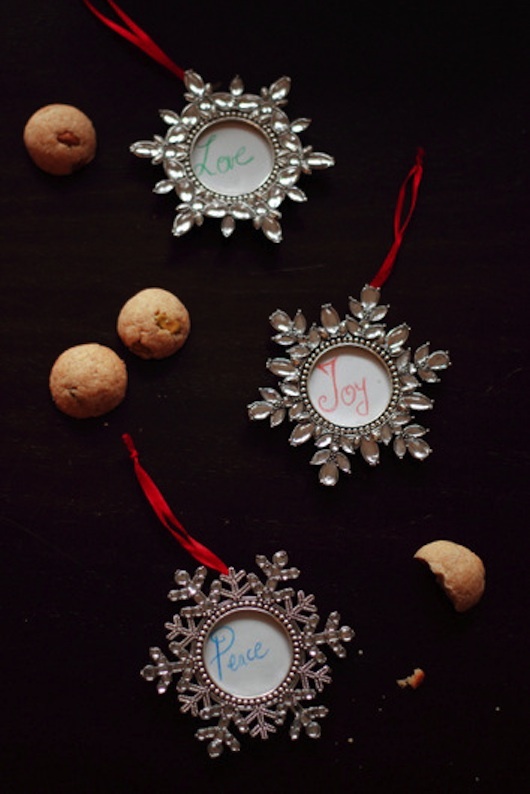 They are very easy and quick to make (perfect last minute gift) and a sophisticated cookie swap option. But first, let me share a little bit about me. I blog over at Magpie's Recipes. And like Shulie, I love to cook and also may be slightly addicted to baking. Then there is this thing. I love dried fruits and nuts and I love cake but ironically, I do not like fruitcake. Never have. Sure I will eat it if you offer it to me, but secretly wish it was chocolate instead. So being a Malayali, it was that one thing about Christmas that was a bit of a nightmare, because during Christmastime, Malayalis (other than myself and my siblings) go nuts for fruitcake. I don't know how they ended up being so popular. Probably because of the strong British influence in Kerala and several other states. All I know is my aunts would begin soaking the fruits and nuts in brandy months and months in advance and start churning out cakes by the dozens come December. Our holidays were always spent at my grandmother's home in Kerala and my father would drive us up and down the entire state to visit nearly every member of our large extended family. Every home we visited, we were offered fruit cake baked with love and pride by the lady of the house. If we dared to decline there would be furrowed brows and pinched lips from our parents and no end to the lecture on manners when we got back home. So we smiled weakly and ate. My poor kid brother would cram the whole slice in his mouth and swallow in the hope that the torture be over fast. But then our aunt would mistake his haste for enthusiasm and offer him several slices more! Even if we managed to avoid or survive those fruit cakes during the visits, they would be waiting for us at home. A whole army of them. Neighbors, well wishers, distant relatives would all come home bearing them. When someone joyfully thrust a box in my hands I would wish hard that it was a doll or a book... but no, it would just be another dreaded fruit cake. Then this one time we visited an aunt who didn't bake much and when she heard we were coming over she had bought some of these buttery biscuits from a bakery near by. They had a hint of cardamom and we joyfully pounced on them! Today when I make them in my own kitchen, I always remember our relief and glee! When I moved to the States I was ecstatic to find that no one seemed to exchange fruit cakes here. Instead they exchanged cookies! Glorious cookies of different shapes and sizes and flavours! While I know there are many fruitcake haters like me out there, I have never met anyone who refused a cookie, or accepted them with that resigned, silently suffering face I know so well. 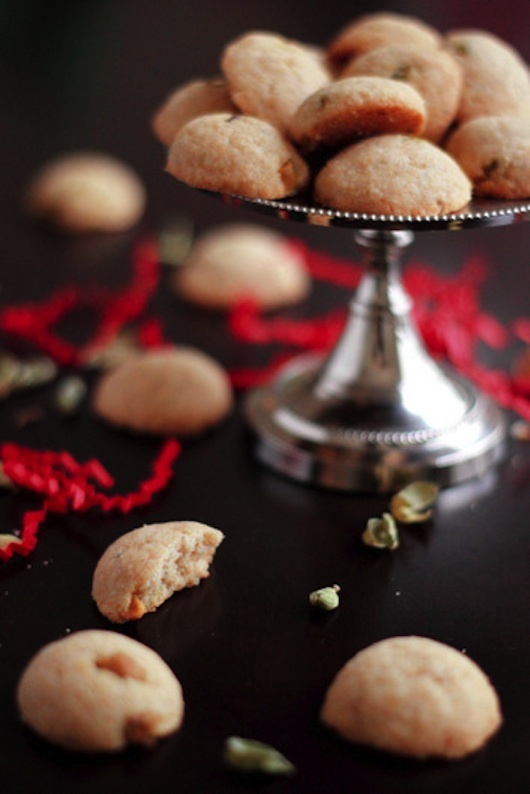 Especially when it comes to these cardamom scented and nutty wholewheat cardamom Nankhatais. I read in different places that these not overly sweet, buttery cookies apparently originated in Surat due to the influence of the Dutch there, or were brought over from the middle east by Iranians. In any case they are popular across the country in different forms. And why not. When flour, butter, cardamom and sugar combine, magic happens!In Kerala they are commonly called "Venna" (butter) biscuits. I like them with tea or coffee ( yes I am a dunker) and I think they would go equally well served with alongside wine. In some places whole wheat flour or the atta used to make chappatis is used to make them which gives them a rustic nutty taste that I love. In Kerala they are commonly called "Venna" (butter) biscuits and usually made with all purpose flour which makes them more tender and melt in the mouth. Some people even add besan (garbanzo bean flour) or semolina for a different texture. I add a handful of chopped pistachios, but you can add any nut of your choice, or even pumpkin seeds but you don't have to. I love the taste of the cardamom which perfumes your kitchen as you bake them, but feel free to swap with your favorite spice instead- cinnamon, nutmeg, even a little anise, cumin or fennel which I am increasingly loving using in sweets these days. To brighten things up you can even add some citrus zest, or other creative add ins like chocolate chips, M&M's, sprinkles, crunchy cornflakes..though they are quite perfect just as they are. I hope you enjoy them! My best wishes to you Shulie, to your readers and all your loved ones. Preheat the oven to 350 F Put the butter/ghee and sugar in a bowl and mix well with a spoon. Pour all the other ingredients into another bowl and stir well, no need to sift. < Now mix in the butter/ghee and sugar mixture and gently knead into a soft dough. Don't overwork it, we just want it to come together into a ball. If the dough is too dry to come together, you can add a tablespoon or so of milk and mix again. If the dough seems too oily which can happen if you use ghee or if it is very hot where you live and your butter has melted too much, just stick it in the fridge for 10 mins and it should be easier to work with. Roll into even sized balls or what I do is to use a half tablespoon measuring spoon to scoop the dough, scraping away any excess. Slide the little half sphere out onto an ungreased, unlined baking sheet. Bake for 10-15 mins if you use the 1/2 tbsp measure or a little longer 18-20 mins if you rolled them larger, until they turn a light golden brown, especially at the edges. They may seem soft and crumbly but they will harden when cooled.They taste best warm and freshly baked like all cookies do. But once cooled can be stored in an airtight container for atleast a week and I have even frozen them in a vain attempt at portion control! What lovely cookies! They must taste wonderful. Looking forward to the rest of the series, Shulie. Happy Holidays to you both! Jean, you are so lucky to be at the receiving end of these gems. Happy Holidays! Delicious recipe. Rose is such an awesome baker and I had the opportunity to try few of her creations. 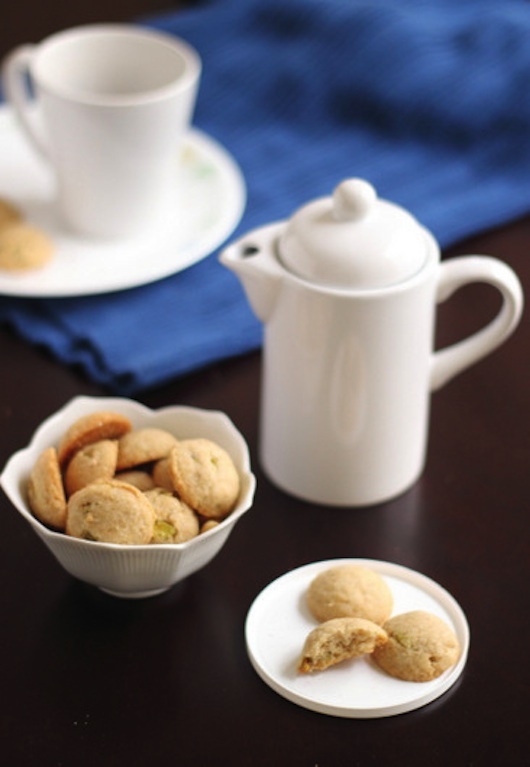 We love nankhatai with tea and I love to make them with whole wheat flour. Happy Holidays to both of you. Another lucky recipient of Rose's baked good. I wished I lived nearby too. Happy Holidays Vijitha! Delicious looking cookies Rose. She is such a sweet girl. Rose pictures are very beautiful and its way too tempting. Merry christmas and Happy new year to both of you. So am I :) Happy Holidays Kate! Me too, Kate! :) Happy Holidays! 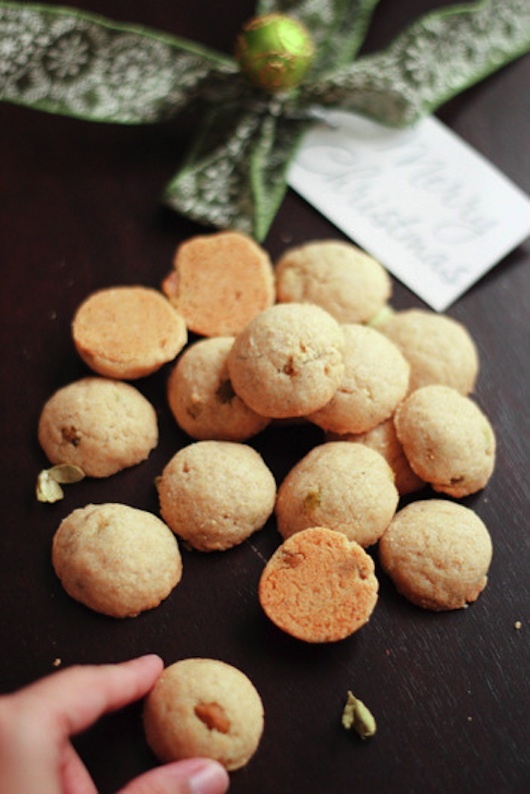 Buttery cookies are my favorite, I love the pistachios! Thank you so much all for dropping by and reading Rose's Christmas traditions in Kerala, India. It's fascinating. Thanks for all the holidays wishes. Merry Christmas to you who celebrate. Happy 2013 to all my readers! My daughter and I were seduced by this recipe and baked these buttery, aromatic treasures last night. HEAVEN!! Indian cuisine seemsto be not only known for their special spices, but also with their tasty desserts. Thanks for the post.